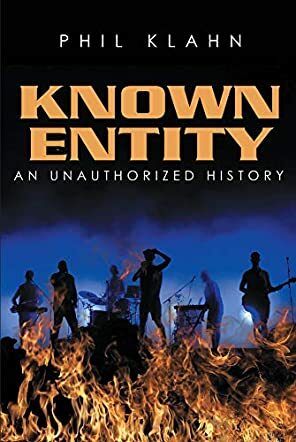 Known Entity: An Unauthorized History by Phil Klahn is a fun read, a narrative that captures the soul and spirit of a band. It opens with a short prologue that explains why some bands disintegrate: "Bands come and bands go. Some fade quietly, eroded by neglect or changing interests. Others are consumed in the fiery flames of clashing egos, personalities, and creative visions." Known Entity explores the journey of a group of childhood friends who belonged to a folk rock band and how their lives were brought together by music. AP, Brody, Mert and other characters look back at the memories. The author explores the conflicts, the fun moments, and the fall outs, but then there is the undying love for music, which might rekindle powerful memories. There is a lot to enjoy in this book; the writing that is atmospheric, humor that bites, and the characters that are real and that reflect a background that music buffs will love. There is a lot of drama in this book and the drama feels so real as does the conflict. Moments like longtime friends and founding fathers of the band, the lead singer and the lead guitarist, at each other's throats and trading blows on the side of a rural highway are aplenty in the narrative. The humor fills each page of the story and Phil Klahn knows how to translate it into great writing. Known Entity:An Unauthorized History is mesmerizing, a well-written story that is filled with realism and that reveals the challenges of a rock band. I loved it, loved the compelling characters, loved their world, loved the hilarity of their adventures, and the unique voice in which the story is told. Known Entity: An Unauthorized History by Phil Klahn takes us on a journey that many of us experienced as teenagers; forming a rock band at high school and the dreams and pitfalls all that entails. Known Entity was the brainchild of “rich kid” Brody and his friend Kris. Into the mix came drummer Mert, bassist and singer Steff, along with technical whizz AP. Together they formed the band Known Entity, which they all dreamed would some day take them to the fame and fortune they were so obviously destined for. The book follows the dramas and evolution of the band through to its inevitable break up, detailing the ego clashes, the artistic clashes and the petty jealousies along the way. Unlike some bands, Known Entity never actually became much of a Known Entity – they were one of the multitude of bands that started full of hope and promise, only to end in recrimination and despair. Told as an interview with surviving band members some thirty years on, the book also traces the history of the members since their dissolution. As a bonus, the author has included YouTube links to the songs discussed in the novel. A clever innovation, for sure. If you love music, or were ever part of a band, this novel will absolutely resonate with you. This was a great read and one I can definitely recommend. Perhaps it was the nostalgia kick, but I found myself intimately drawn into this fascinating story of music and group dynamics. What I particularly liked about Phil Klahn’s tale was exactly the fact that we weren’t dealing with an even moderately successful band here. The band was a miserable commercial failure, yet the author still managed to convey the dreams and aspirations of these young people who, like so many other musicians, faced insurmountable odds in achieving even moderate success at their chosen craft. I also liked the idea of interviewing the band members 30 years on, to compare their memories of the Known Entity time and their personal takes on what exactly happened to destroy their dreams. Summarizing their lives since Known Entity was a nice touch as well. What the author succeeded at most, in my opinion, was conveying the undying passion for music he clearly has through the characters in this story. Using a “non-playing member” of the band, AP, as his primary source was a stroke of genius and gave the work a much more balanced approach than perhaps would have been the case if he had focused it around the lead singer/songwriter. Known Entity: An Unauthorized History by Phil Klahn is the story of a band, a story that is unlike any other. In this tale, the author explores the dynamics of relationships between the band members, unveils the tension that rocks it, and the differences in personalities that eventually lead to its dissolution. Years have passed by, and as the members recall what it was like to play together, the fire rekindles in their hearts as they unearth new revelations. The story is filled with drama and the hilarity of a rock band. What happens when the lead guitarist and the founder of a band turn against each other in a violent fight? Here is a book that music buffs and fans of emotionally charged narratives will enjoy. I doubt Phil Klahn doesn’t belong to a band because the writing in this book is so real that readers feel close to the characters. The interactions unfold realistically; the dialogues explore different themes — teamwork, friendship, family, love, and social issues — and, most importantly, what it feels like to belong to a band. The author has a gift for character development and they come off the pages filled with life and humanity; Thomas Andrews "aka" AP, Phil, CB Johnny, Brody and others. I just loved how the dialogues read so naturally and how the author uses them to explore the depth of the characters. For instance: “Brody was the guy, the mastermind. He put it all together and then he tore it all apart. Wrote the songs, recorded them, and then threw them away . . .” Known Entity: An Unauthorized History is a rollicking ride, an adventure in music, and a narrative with a huge potential for entertainment. The kind of book that will keep you reading through the night, filled with biting humor and nonstop drama. Known Entity: An Unauthorized History is a work of contemporary real-life styled fiction, penned by author Phil Klahn. This novella-sized work of fiction depicts the story of the rise and fall of fictional band Known Entity, as written by their ‘biographer’ and band member AP. AP has seen and done a lot in the music industry, and with the help of his fellow band members, he recounts the rollercoaster ride of success with Known Entity and the personal struggles that each band member faced. What results is an amusing and realistic account of band life, told through a fictional band that is made progressively more real as the story unfolds. Author Phil Klahn’s biographical style of narration takes a moment to get into, but once you’re in it’s a really engaging and original way to tell a story. It’s easy to forget that Known Entity isn’t real, especially with actual links to real songs that you can access during the reading experience. I found the development of all the band members to be fully realized, to the point where I was reading about actual musicians. The research and lived experience which has gone into the novella is clear from the start, and Klahn’s narrative style is fluid and rarely breaks character to seem contrived or structured. I thought each of the band members had a distinct voice and atmosphere when they were ‘in their own words’, and the character of AP holds everything together really well. Overall, Known Entity: An Unauthorized History is an excellent read for music fans and industry lifers. When author Phil Klahn is introduced to Thomas Andrews one evening, he is not aware of the type of relationship that has been conceived. Fellow musician Thomas Andrews, aka AP, has the stories that feed Phil Klahn’s artistic larder. The mystery behind AP’s career history encourages Klahn to dig deeper into the back story of the band called Known Entity. The story behind the band members -- Kris, Brody, Steff, Mert, and AP -- haunts him until he finally has the band break-up story of all times. While the band fumbles through stereotypical trials of second-rate rock bands of the time, their story is also full of hidden demons, both physical and emotional. In Known Entity: An Unauthorized History, Phil Klahn recalls the heart-wrenching, yet realistic story of band members bonded by their shared passion, yet loosely entangled in contrasting ideas of artistry. Phil Klahn shares both his words and (remixed by the band Phankl) original songs of Known Entity. A combination of folk and sixty-ish gentle rock, the lyrics to such songs as Fixed, Chai Tea, and Too Loud demonstrate a more simplistic innocence of another era of music and creativity. Phil Klahn’s interview with AP as the foundation of the project, and later with the corresponding band members, is insightful and downright fascinating. Klahn includes many internet links to the actual sound tracks studied in the manuscript. Laced with the sound influences of such stars as Momma Cass and Dusty Springfield, I believe that any lover of music will enjoy reading about (and listening to) Known Entity.